Teshager, a goldsmith turned knifemaker, has work worthy of comparison to the famous jeweled-egg creator, Faberge. 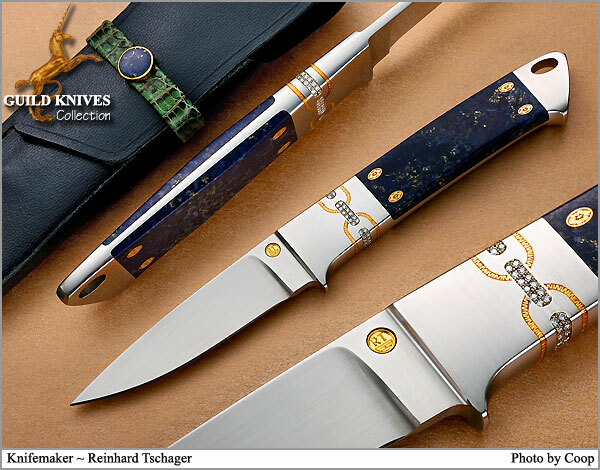 This integral, tapered tang knife, with deep blue lapis inlays, is accented with fifty-two diamonds surrounding the front bolster. Eight gold inlayed and engraved oval medallions are set into the lapis. The blue leather sheath complements the knifeâ€™s high quality, with a gold closure tab inset with lapis.